Ringsakiddy near Cork in the Republic of Ireland is seeing a massive €100m redevelopment of its harbour as part of the general resurgence in the Irish economy. As well as being a key port it is an important industrial centre. 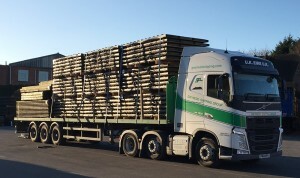 This load of Ransfords acoustic fencing panels, ordered by Ireland’s premier provider and installer of fencing systems Mulligan Fencing, is the first of many on its way to Ringsakiddy via Liverpool to help mitigate noise pollution created by the expansion there.